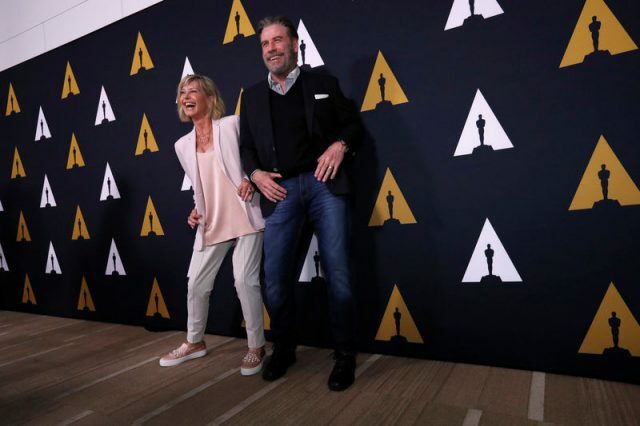 “Grease” stars Olivia Newton-John and John Travolta on Wednesday celebrated the 40th anniversary of their classic movie musical about teenagers finding their way at the fictional Rydell High. The pair posed for cameras and showed off some dance moves at a screening in Beverly Hills hosted by the Academy of Motion Picture Arts and Sciences. Also attending the event were co-stars Didi Conn, who played Frenchie; Barry Pearl, who portrayed T-Birds member Doody; and director Randal Kleiser.